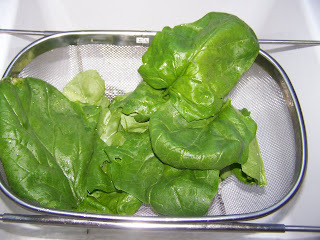 We've been eating spinach and lettuce from the garden for a few weeks now. 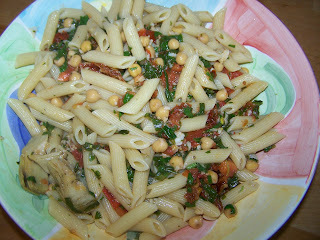 Pasta is a pretty regular dinner around here because it is quick, easy, filling and delicious. To make this, I cooked (slowly) some garlic in oil for a few minutes then added some broth and tomatoes and let it simmer for just a minute. Then I added greens (spinach) and herbs (parsley) at the last minute. Toss it with hot pasta and top with cheese. This time I used Gort's Gouda cow feta and boy, is it ever good. 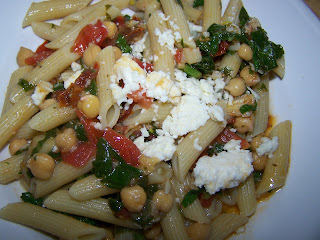 I added chick peas too because E had been snacking on some and I wanted to use up the rest. Mmmm. I made this last night but used leaves from a rainbow chard plant that overwintered instead of spinach (we've had several feeds of spinach too and mine is bolting already -- why oh why?!?!). YUM! I put my sauce into the blender to mix it all up so my wee P wouldn't be turned off by the chunks. He didn't know he was eating heaps of chard! That looks so yummy. I think I might have to stay away from your blog while I'm fasting! The broth most give it a amazing final touch when it comes to taste.